"Vengeance" Flying Dragon Wall Mounted Sculpture / Wall Art | BUDK.com - Knives & Swords At The Lowest Prices! 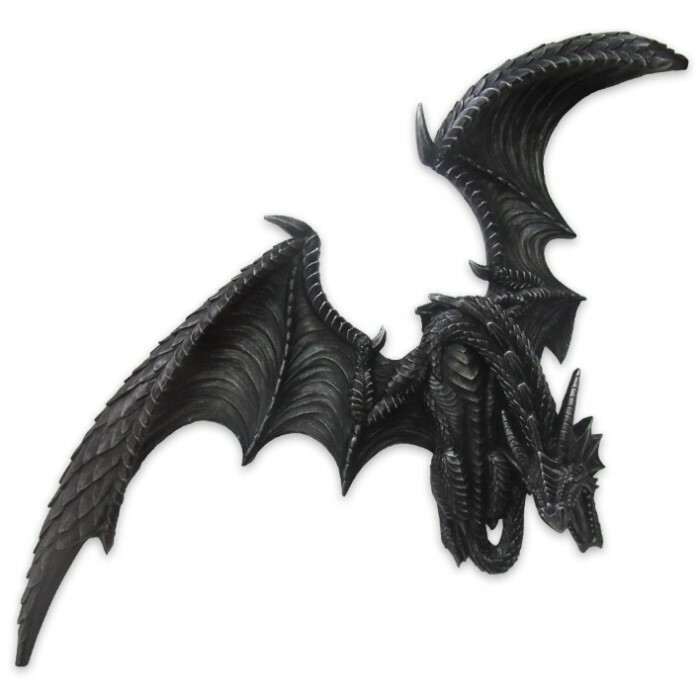 If you often find yourself imagining life in grim fantasy worlds ruled by grotesque goblins and menacing dragons, you'll love the deliciously dark "Vengeance" Flying Dragon Wall Art! This eerie wall-mounted sculpture depicts in striking detail a colossal winged dragon known ominously to those he terrorizes as "Vengenance." The terrible saurian gazes downward menacingly, his jagged, razor sharp teeth laid bare for all the world below to fear. Lithely, his neck arches as he surveys his vast dominion, and the sinister spikes that ridge his serpentine body point skyward - casting haunting barbed shadows on the earth below. Boasting an imposing 18" wingspan, "Vengeance" in flight is simply breathtaking - truly a sight to behold. Whether you mount it at home, at the office, in a studio or anywhere else, this stunning effigy of the awe inspiring mythical beast called is sure to be an instant conversation starter, admired by all who glimpse at it. Molded from tough cold cast resin and hand painted varying shades of charcoal, sable and black to accentuate the myriad fine details, this bleak-chic piece is built to last and includes durable mounting hardware and easy-to-follow instructions. It's perfect for anyone whose decor tastes lean toward the dark and fantastical and makes a terrific gift for fantasy enthusiasts, Goths or anyone who simply appreciates fine art and decor with a lurid sense of adventure.